Shark teeth are among the most common of all vertebrate fossils. While such abundance may befit creatures renowned for their appetites, it contrasts with the rarity of shark skeletons. Sharks, rays, and their less numerous kin the chimaeras, or ratfishes, are characterized by skeletons composed of cartilage rather than solid bone. (Collectively, they are known as chondrichthyans; bony fishes are the osteichthyans.) After a shark or ray dies, the microscopic layer of phosphate prisms covering the cartilage, held together by a framework of collagen fibers, is easily shattered into thousands of fragments. Happily, just within the past two decades, discoveries of more complete remains (notably of Stethacanthus in Scotland and Falcatus in Montana) have enabled paleontologists to give form to many fragments and to discern the prehistory of sharks and their relatives. 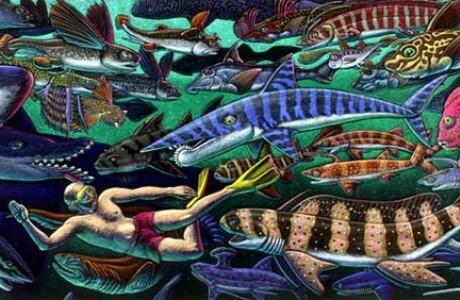 In Swimming with the Sharks (detail), the artist portrays himself among living and extinct cartilaginous fish known from various localities around the world. And what a colorful prehistory it is. Modern shark diversity seems dull compared with the array of chondrichthyans that existed in the period. 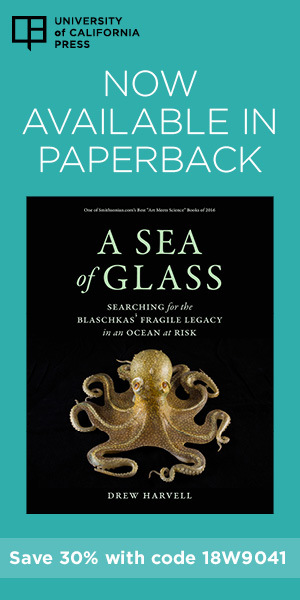 At that time, from 360 to 300 million years ago, large parts of present-day Europe and North America were covered by warm, shallow seas. Sharks and their relatives flourished in this subtropical marine paradise. We know of more than two dozen families, but any tally in the fossil record is bound to fall short. We are limited to the fossils we happen to find, and these never give us the complete picture. In today’s well-studied oceans, we recognize forty families of chondrichthyans. More pertinent to the question of diversity, however, are the differences among families. Today, most sharks are modest variations on the basic shark theme. In the Carboniferous, sharks were wildly distinctive. A relict of this dramatic ancient diversity is seen today in the chimaeras, whose name, from the fantastic animal of Greek mythology, reflects their bizarre anatomy. Ancestral chimaeras diverged from mainstream shark evolution and gave rise to many weird and wonderful creatures. Some had armor-plated heads rivaling those of the ponderous placoderm fishes that lived during the preceding Devonian period. Others, such as Iniopera, Sibirhynchus, and Iniopteryx, bore recurved and barbed spines projecting from their fins and bodies. The cochliodonts, among others, used batteries of tooth plates—expanses of fused teeth—to crush their prey. Today, this array of chimaera body plans is gone. Only the elephant fish (Rhinochimaera) and ratfishes (Chimaera and Callorhynchus), with their large upper and lower tooth plates, have survived. Sharks of the Carboniferous were as highly specialized as their chimaera cousins, and their overall diversity is comparable to that of modern-day reef-dwelling bony fishes. This suggests that sharks were once able to divide up the highly productive, warm-water reef environment into many distinct niches in ways their present-day descendants do not. (By contrast, bony fishes, which dominate in numbers and diversity today, were relatively unspecialized 300 million years ago during the heyday of cartilaginous fishes.) Some Carboniferous sharks had elaborate secondary sexual features in the form of specialized spines and barbed hooks on their heads and back fins. Male Stethacanthus, Damocles, and Falcatus may have used these adornments to attract females. Other ancient sharks, such as Helicoprion and Ornithoprion, evolved tooth whorls in the lower jaws that looked like, and probably worked as efficiently as, buzz saws. Still others developed a complex conveyor-belt mechanism for rapid tooth replacement. These last are the kinds of sharks that survived through the age of dinosaurs to the present. Their teeth were used for just weeks or even days before being shed. Far from primitive, the kinds of sharks and rays living today are highly evolved. 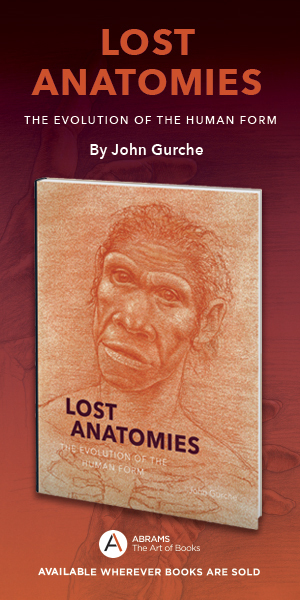 They derive from an ancestor that appeared 200 million years ago, midway along the chondrichthyan evolutionary time line and at about the same time as the precursors of mammals and birds. Stingrays first appeared about 60 million years ago and thus are from a lineage no older than that of horses and primates. The tooth replacement so characteristic of modern sharks seems to have evolved in fits and starts. The oldest fossil shark teeth are those of predators that lived some 400 million years ago. Extremely rare, many early shark teeth display signs of considerable wear and tear. By the Carboniferous, shark teeth were, like their bearers, more plentiful and diverse and were being shed before they were even blunted. By the Jurassic and Cretaceous (between 200 and 65 million years ago), most sharks were replacing their teeth rapidly and in great numbers. The isolated tooth fossils of sharks such as Hybodus are often still as sharp as the day they were shed. There were two post-Cretaceous quantum leaps in shark-tooth production. 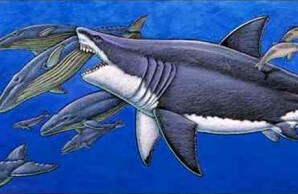 One occurred during the Eocene (56 to 35 million years ago), when essentially modern shark faunas became established, and the second during the Miocene (23 to 5 million years ago), when the greatest of the great whites, Carcharodon megalodon, plied the oceans wielding six-inch, serrated tooth blades. Like their modern descendants, many Miocene sharks replaced each tooth every few weeks, processing and discarding thousands in a lifetime. “Voracious evolution” indeed!